Landor Associates, the brand consulting and design firm located in the historic Shillito Building between the 600 and 700 block of Race Street, connected the creative flow within its company to iconic local artists to create a new window display series, titled SmashUP Creative. Dramatic storefront windows, that overlook the busy downtown street, once housed the latest fashions within the Shillitos Department Store. But over the last year they have contained art installations created by Landor employees to help inspire them and help them think about their in-house brands in a completely new way. “We use our windows as an opportunity to inspire our employees who create the displays, to engage the city of Cincinnati and to inspire all who pass by,” Landor employee Mara McCormick told UrbanCincy. For this particular exercise the branding teams for Crest, Cheers, Sour Patch Kids and Old Spice were encouraged to brainstorm artists’ work that they admired, with the goal of using the work as a catalyst for a new brand strategy. The employees chose five extraordinary artists: Nuesole Glassworks, Visionaries and Voices map artist Courttney Cooper; street artists Higher Level Art, Kentucky designer Keith Neltner and illustrator Charley Harper. The teams got inspired by the artists’ styles, and infused it into conceptual packaging ideas for their brands. 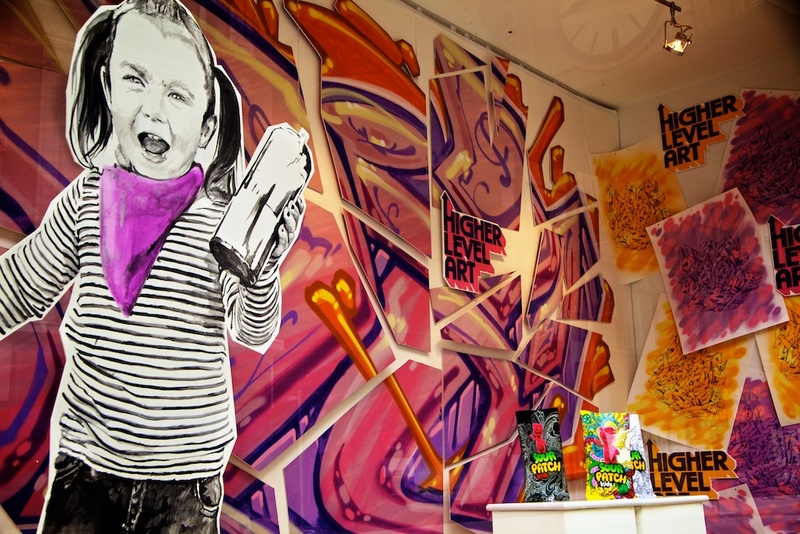 Sour Patch Kids, for example, worked in elements of street art and illustration inspired by the work of Higher Level Art into their candy package design. Some designers were moved to create their own brand, Bugaboo; a line of grilling products with package design inspired by Charley Harper’s iconic animal illustrations. The experience allowed us to connect with artists and the creative community. It opened our eyes to new styles and artistic techniques which we can apply our own design process. SmashUP Creative gave the teams an opportunity to step out of their cubicles and away from the office to discover the inspirational work of artists all around the city. One of the Landor teams, for example, visited a studio loft where the late Charley Harper’s work is stored. They sifted through hundreds of archive pieces, some which had never been shared publically, and spoke with those who knew him. “We were grateful for the chance to learn about and get close to an artist who we greatly admire,” said McCormick. Passersby are encouraged to not only check out the windows, but to also learn more about these local artists and the contributions they have made.